The Advertising bust, which we call The Stick-a-Sole Man, used to stand in the window Of Ken Mundy’s High Street shop. Ken was a village character who ran his shoe repair and sales business between the Co-op and the newsagents until he retired in about 1980. He is remembered by older inhabitants of the village for his very late adoption of mains water. Even after World War Two, Ken could be seen walking down to Broadwell with his yoke and two buckets to collect his water. Apparently his pigs fared better for mains water was laid on to them, kept in an area off The Clays. He’s quite a detailed model, some 22 centimetres tall, standing there, holding a shoe which is fitted with a real, if small, Phillips stick-a-sole. The Phillips firm was set up by Walter Phillips from Cardiff. It is thought that his stick on soles – to double the life of your shoes, were in use by the 1930s and the advert man, made of a rubberoid material (similar to the soles, perhaps) probably dates from that era as well. This entry was posted on January 20, 2010 at 10:57 am and is filed under Museum. You can follow any responses to this entry through the RSS 2.0 feed. You can leave a response, or trackback from your own site. i would like to buy phillip stick on sole and sell in my country kenya.kindly give me whole sale price for export. We know nothing about prices at a museum. We only preserve the old items. I had a shoe repair shop in South Ealing London from about 1949-1957 and had a high turnover with phillips stick-a-soles. Repairers were supplied with a set of about 20 or more lightweight card templates to fit every shape sole. From these, we were able to order our stocks . Good old days ! My Mum has one of these as my Dad was a cobbler and clogger.Any idea how much the s-a-s man is worth? Sorry. We’ve no idea. Probably not much in cash terms – but priceless to us as a piece of Market Lavington history. Do you know who the model was for the Stick-a-sole man? I am thinking that it is possibly a “family story” but I have been told by my Mother that it was her grandfather/great grandfather (can’t remember which she said now!!). Tommy K says : 2005 my partner Karen bought me this wonderful “Stick-A-Soles and Heels” man figure in an antiques shop in Leeds. It is in a very good condition! Now it stands on my fireplace and everybody who comes into my house admires it. I don’t suppose he ever told you who the model man was based on?? 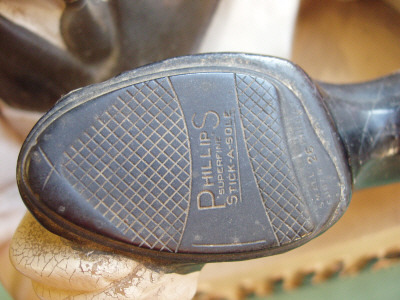 Do you have any information about another advert for Phillips stick on soles. My Dad was a cobbler and had an advert in his shop. It was a vase of roses. When he retired he took up oil painting and copied this poster and I have the picture in a bedroom. If you contact me I could send you a photo of the painting. The original poster has not survived. Dad died aged 92 in 2007. I have one of these it belonged to my grans brother who was a cobbler. My great uncle was Walter W Phillips who founded the firm in 1903 that made Phillips Stick-a-Soles (a registered trade name). I worked in the UK sales office for the Company from Jan.1956 to May 1965 at their Western Avenue, Acton London W3 distribution centre. Department. The model was “loaned” to shoe repairers who numbered about 40,000 in the UK in the mid-1950s. The model should have a pair of wire glasses/spectacles. The Company was particularly successful in supplying the “military set” of rubber soles which were used in WW1 in the trenches. The soles and heels were made in their Bromley Street, Dantzic Street, factory in Manchester.. Although he ws nothing to do with the museum, our cobbler reminds me of my grandfather who was a cobbler in Sussex and had one of these men. can anybody tell me how much they are to buy ? Our only concern is value in telling the story of our village and parish. Cash value – probably very little, is of no real interest to us. We at Cuckfield Museum in Sussex have one of these on loan from a local resident to enhance our current footwear display. He has a pair of wire glasses and is bending much lower over the shoe he is holding – perhaps there was more than one version of the figure? I think there are different models. I have a feeling that yours might be the slightly more modern one, but equally lovely. Was wondering if there was any information on Mr. Phillips, as he has always been called in my famiy, and as I was researching the net came across this site. My sticker sole man was rescued by my father sometime between 1967 and 1975 – he was about to be assigned to a rubbish dump and then a bonfire outside our local saddlers’ shop, Outrams, in Sevenoaks (now a Loch Fynne Restaurant). My father was manager of Westminster Bank which is located next door – now NatWest. Mr. Phillips has been with us ever since. Though we have no connection with cobblers we have just loved him! He has never had glasses. I was wondering whether to put him into our local auction as part of down-sizing and am now not sure whether I can let him go! I am a great nephew of Walter W Phillips who founded Philiips Stick-s-Soles Limited and Phillips Patents Limited in 1903. I worked for the company between January 1956 and March 1965 in their head office sales department, Western Avenue, Acton, London W3. My uncle, Lester H Button, a nephew of WWP, was a director of the company at that time and worked for them for over 35 years. The manufacturing of the stick-a-soles took place in Phillips’ factory in Bromley Street, Dantzic Street, Manchester. The company knew of about 40,000 shoe repairers who were called upon by a representative team of 38 sales representatives at least every 8 weeks. A number of these repairers had learned their trade on demob from the services (WWII) and were better at fixing army boots rather than the fine stiletto heels on ladies shoes that came into fashion and onto the market in the 1950s and 1960s. 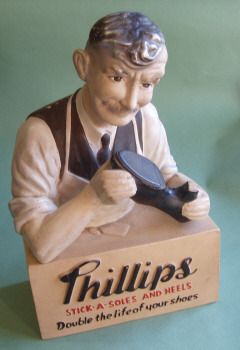 The “cobbler” or “Phillips Man” was given to reputible shoe repairers for window display on a loan basis. The ownership retained by the Company. Each model has a reference number and in the 1950s I maintained the register of where each one was in the UK. I cannot recall now how many there were, but I would think about 2,000 or so of them. The representatives’ names were Armstrong (Yorkshire), Ashwell (N.London), Barr (N.Ireland), Bond (Essex), Bradley (Lincs), Brockett (Middlesex), Coombs (Kent/Sussex), Copsey (Essex), Coray (SW London), Cutting (SE London) etc. More names known. An elderly relative recently passes away having been a cobbler for many years. Amongst his belongings we have found 2 Phillips stick a sole men both wearing glasses, a Phillips ashtray & a meltonian man.